The floodlit skyline of Dresden with the Hausmannsturm at the left and the Hofkirche at the right and their reflexions in the river Elbe at the blue hour after sunset. 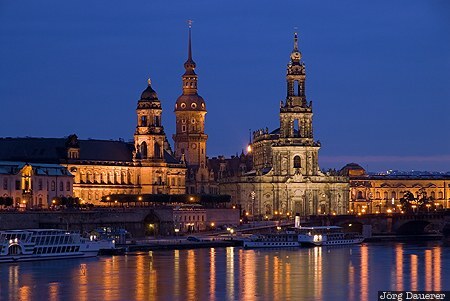 Dresden is the capital of Saxony (Sachsen) in the east of Germany. This photo was taken in the evening of a rainy day in June of 2009. This photo was taken with a digital camera.